Quinn Rollins: Play Like a Pirate: Graphic Novel Review: Can't We Talk About Something More Pleasant? 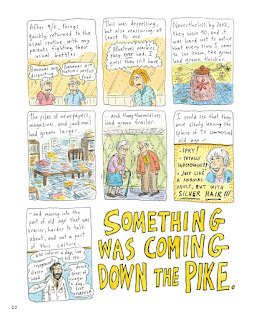 Graphic Novel Review: Can't We Talk About Something More Pleasant? In most families, death is a taboo topic. 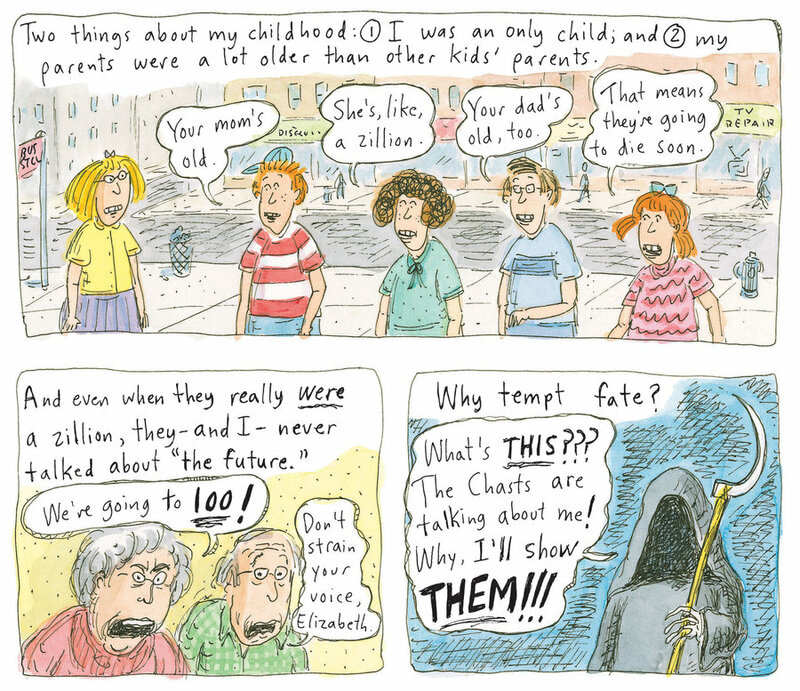 I'm in my mid-forties, my parents are almost eighty...and unlike other families, my parents have been preparing us for their deaths for the last twenty years or so. Morbid, but true. They update us on their "Plans," on how their savings are holding up, on Every Last Detail of their health. It's good to know these things. Right up until they're passing colonoscopy photos around the dinner table. We can draw a line somewhere before that. That doesn't mean we're ready for death. 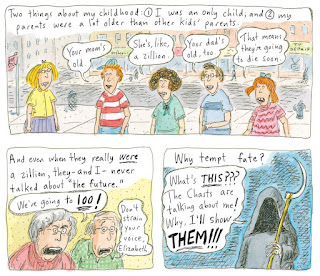 In Can't We Talk About Something More Pleasant, Roz Chast gives us an incredibly intimate look at her experience with her parents' dying. Starting out more than a decade before they actually pass away, Chast details what it's like to see her parents go through their "golden years," with an increasing lack of independence and a corresponding increase in her worrying about them. As an only child, she has to make all of the hard decisions: When they're too unhealthy to stay in their Brooklyn apartment on their own, when they're in need of moving into a retirement community, when they need to move on to a full-time care facility. As she tells the story of their decline, she also tells the story of growing up with them, of her parents' relationship with each other. Parts of her story would be familiar to any child of aging parents, but parts of it rang especially true to me and my own family. The refusal to talk about some things (my parents, while remarkably open about many things, are tight-lipped about others), the friction between them, the at once warm and distant relationship with their daughter. I often compare my parents to the Costanzas on Seinfeld, with all of the love and aggravation that this entails. 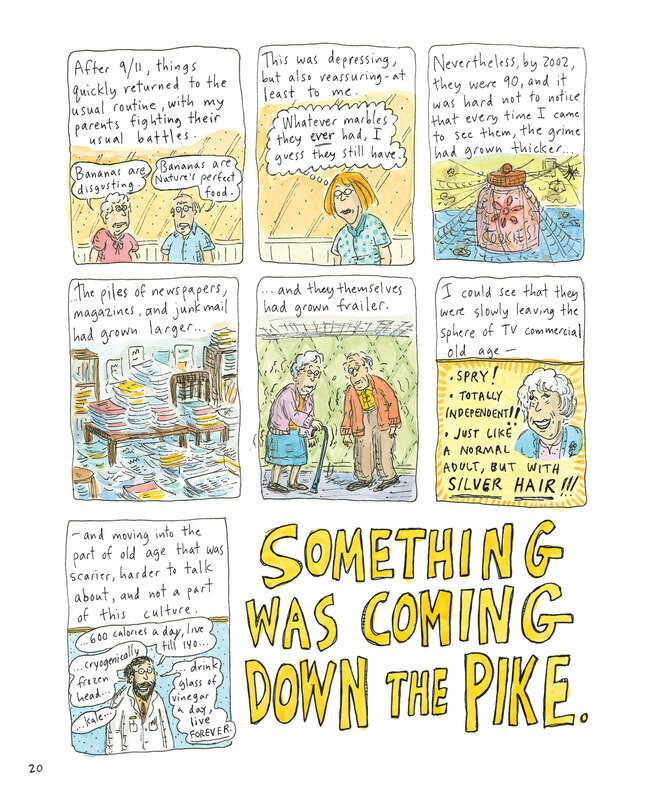 The graphic memoir leads, inevitably, to the death of Roz's parents. 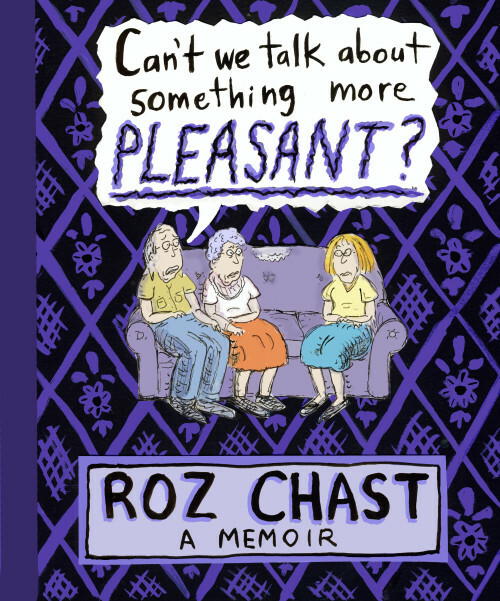 It's beautifully told, and even through the irritation and the fears that Roz is going through as a daughter trying to be dutiful but worried about the costs (financial and emotional) that she's experienced across the course of the years -- it's heartbreaking. Like Roz, we're relieved when her parents do pass, and like Roz, we're a little ashamed at the relief we feel. It's a beautifully told book, unusual in its examination of gerontology and death. That's one of the reasons I like it so much -- it's an unusual story to tell, and one that is too often untold because it's so uncomfortable. We don't like to think about death, we don't like to think about our inevitable fate. This graphic memoir uses the comic book format well, with some pages of hand-written prose interspersed with traditional illustrations and speech bubbles. There are some family photographs in the mix, and even a middle section that has photos of her parents' apartment as she's cleaning it out. It makes it all more real, more warm, more sad. There are other graphic novels that deal with gerentology -- two of the best are Tangles: A Story About Alzheimer's, My Mother, and Me by Sarah Leavitt, and Wrinkles by Paco Roca. The first is nonfiction, the second fiction and the subject of an animated adaptation starring Martin Sheen and Matthew Modine. So if you like your books...animated...check that out. 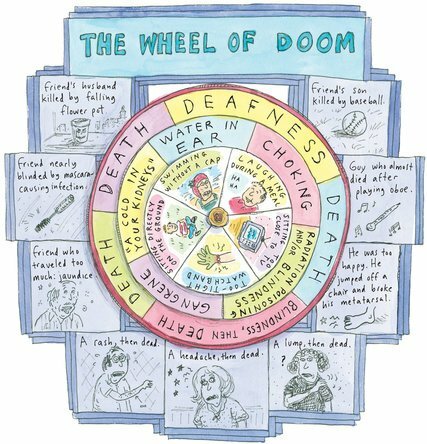 One of my favorite pages, in a morbid way...The Wheel of Doom. Enjoy?